Editor’s note: Leading HIV/AIDS researchers are questioning the legitimacy of the manufacturer’s claims. The company behind the drug is backing off their claims and we’ve reported the scientists reason why this could be classified as fake news in a follow up article. A new medication has shown amazing promise in its first clinical trial. The drug, Gammora, eliminated 99% of the virus after just four weeks of treatment. “These first clinical results were beyond our expectations and promise hope in finding a cure for a disease that’s been discovered over 35 years,” says Dr. Esmira Naftali, the head of development for Zion Medical. Gammora is a synthetic peptide compound derived from the HIV enzyme integrase. That enzyme is responsible to inserting HIV’s genetic material into the DNA of an infected cell. Gammora overwhelms that process, leading to the self-destruction of the infected cell. This works substantially different than other current medications against HIV that prevent the transmission of the virus but do not cure the actual infection. The medication has only recently reached clinical trials, but has been under study for more than a decade. This clinical trial was held between July and August of this year. 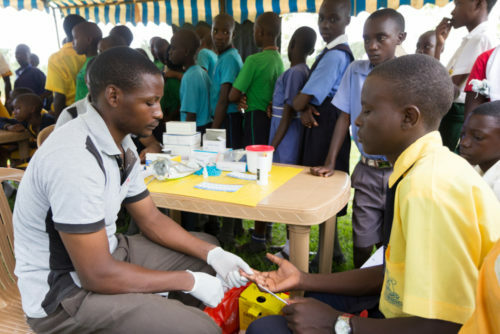 In the first phase of the trial, nine HIV infected patients in Uganda were given different doses of Gammora for 4-5 weeks. Most of those in the trial showed up to a 90% reduction in their viral load in the first four weeks. In the second phase, held just two weeks after the first, these patients were given Gammora in conjunction with an additional retroviral medication for 4-5 weeks. This time, most of the patients showed up to a 99% reduction. Also during the full length of the study, patients showed no side effects from the drug, showing that the medication is safe for consumption. Patients in the study also saw an increase in healthy T cells, important parts of the body’s immune system. Phase 2b of trials will begin in the coming months, and will involve 50 patients in treatment for two to three months.